Shikatani Lacroix Design was commissioned by adidas Golf to create digital experiences intended to immerse, engage, attract and retain customers, as well as stand out in stores. SLD was called on to lead the digital strategy, content creation and brand direction for adidas Golf’s in-store digital experiences. The immersive experience formed an integral part of the adidas Golf retail space by providing them with unique approaches to inform consumers and influence purchase decisions. adidas is a multinational corporation that manufactures and designs sports shoes, clothing and accessories. The company was founded by Adolf Dassler and is based in Herzogenaurach, Germany. adidas is the largest sportswear manufacturer in Europe and the second largest in the world. The company holds numerous kit deals with clubs worldwide and has sponsored national sports teams including, Argentina, Germany, Spain, Russia, Japan, Nigeria and Denmark. The signature three stripes pattern was originally created to provide foot stability but ended up becoming the brand’s logo. adidas has endorsed many players throughout the years and has been seen as the leading brand sought after by Olympic athletes. adidas has been involved in creating innovative and state-of-the-art equipment for many sports. Their latest efforts using progressive technology can be found within the BOOST technology incorporated into the micro-brands of the adidas Golf shoe line. 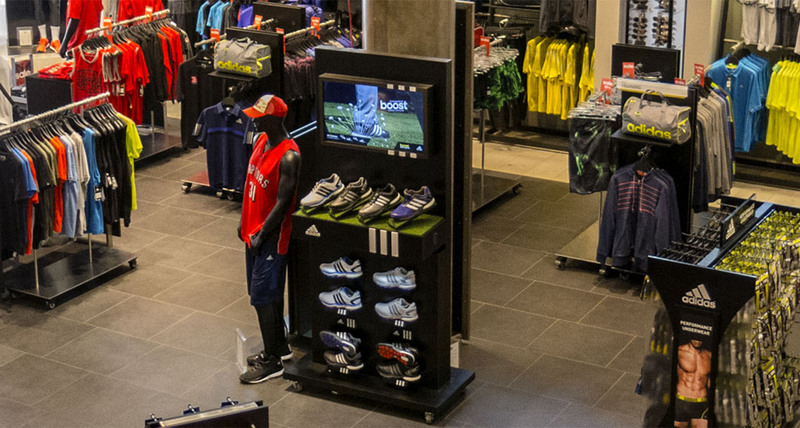 In order to gain strong shelf presence, engage and excite customers, adidas understood that incorporating digital signage would have the ability to enhance the retail experience of shopping for golf apparel, while creating an opportunity to increase brand affinity and heighten sales. adidas Golf remains an industry leader in sporting apparel across many sports due to its quality, reputation and variety of options offered to customers. To further leverage how their identity could play a greater role in building brand equity, adidas Golf was looking for a different hook to draw customers into their retail space. adidas Golf wanted to provide customers the opportunity to learn about their products without relying on the floor staff. 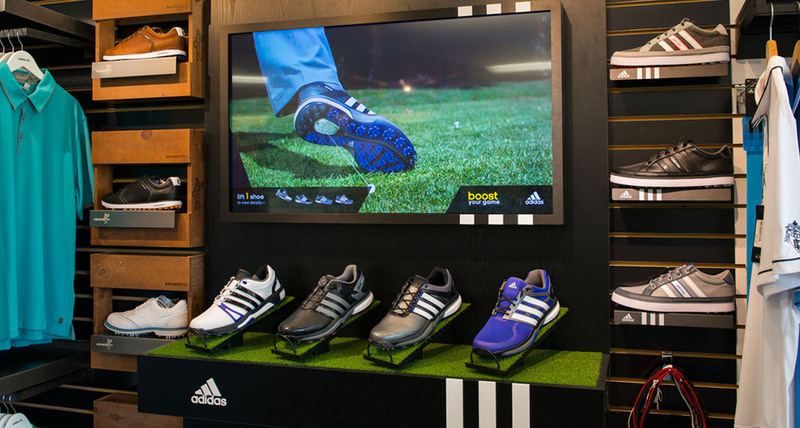 The newly designed shelf space, featuring a unique golf-themed digital retail experience, gives adidas Golf a method of showcasing their forward thinking while simultaneously differentiating their Golf footwear from competing Golf footwear displays. 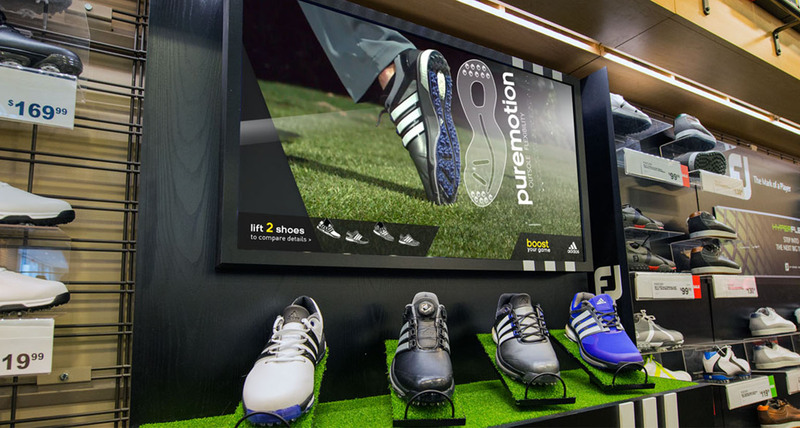 The objective of using digital signage for their line of golf shoes was to provide an avenue that clearly displays the innovation and technology behind adidas Golf footwear. 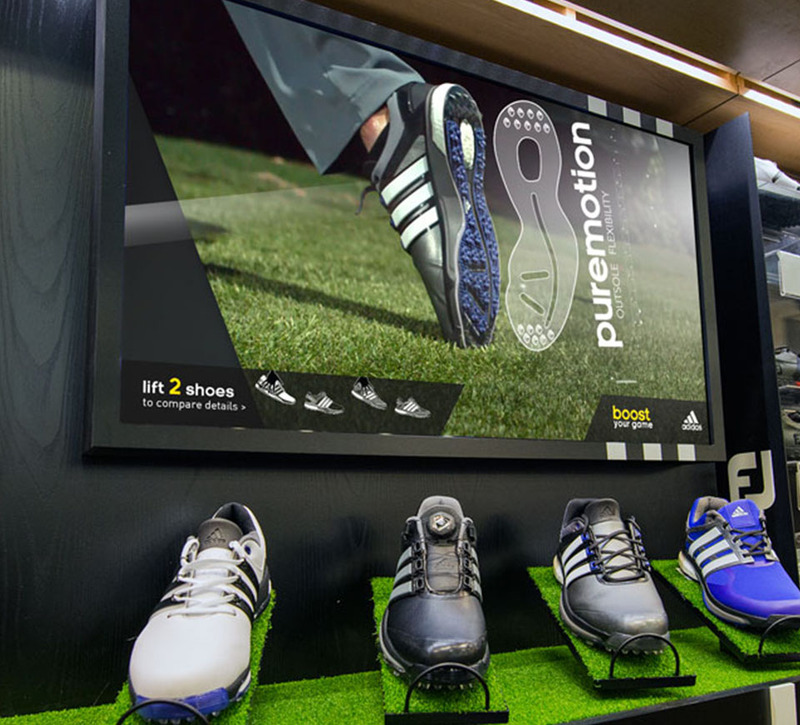 As part of their goal to engage and excite customers about the products, adidas Golf recognized digital signage has the ability to enhance the splendour and message of its brand while creating an opportunity to increase brand loyalty, conversion and ultimately, drive sales. Shikatani Lacroix Design worked with LG leaders in display technology and Dot2Dot Communications leaders in software solutions in order to deliver digital signage displays that would inspire and motivate golf players to purchase adidas Golf footwear. The unique digital displays give consumers the ability to lift a shoe to view product information, or lift the shoes to compare them side by side. 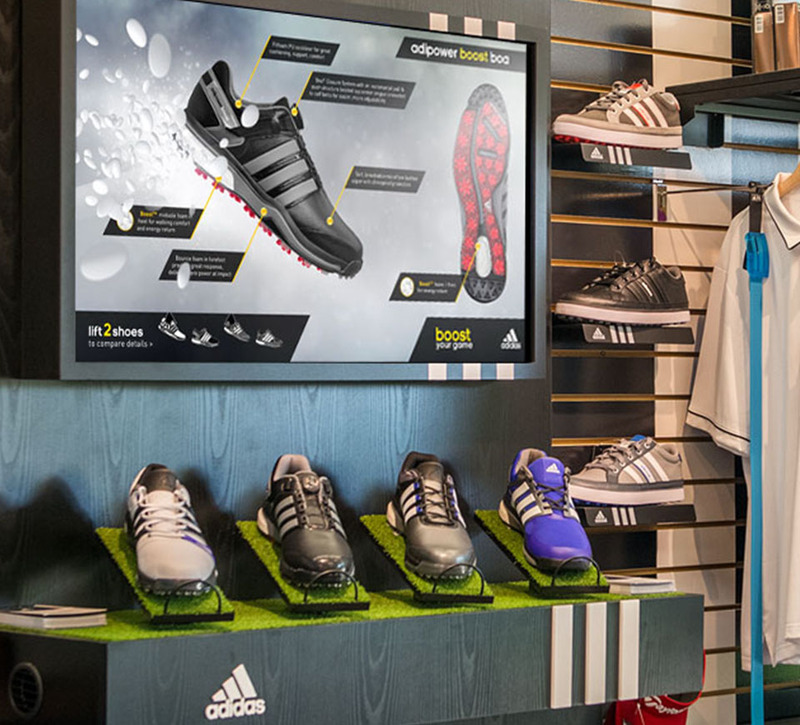 The major purpose behind developing these interactive displays was to provide an opportunity that showcases the innovation and technology behind adidas Golf footwear, and introduce new product lines. 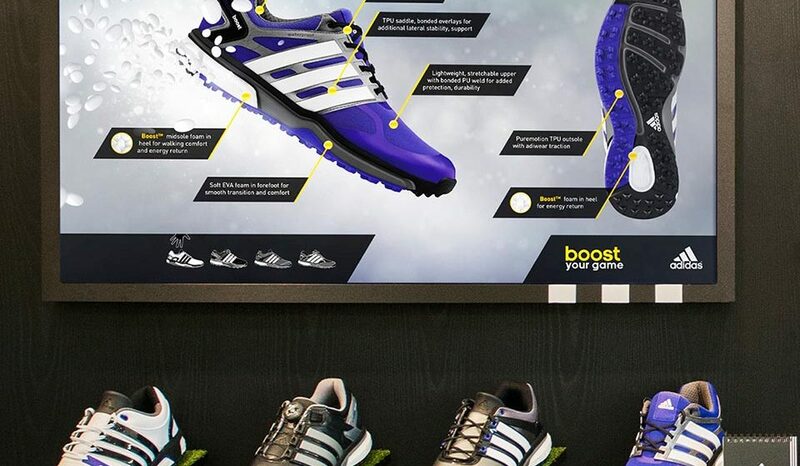 The interactive technology used on the shelf displays provided dynamic signage to highlight the BOOST technology used within the four new footwear categories under the adidas Golf brand. These included the asym energy, adipower BOA and the adipower Sport. 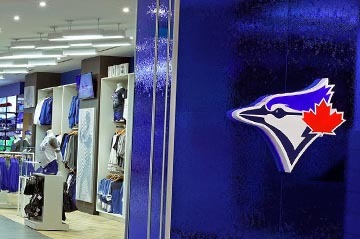 There were two versions of the shelf displays created. 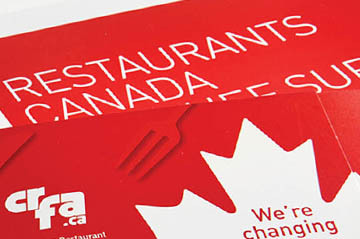 The first option is secured to a slat or grid wall and is 7′ height x 4′ width. The second option is a mobile unit on casters and is 7′ height x 3′ width. Both units include four light-sensor enabled platforms on which the shoes can sit and that trigger specific content when lifted. 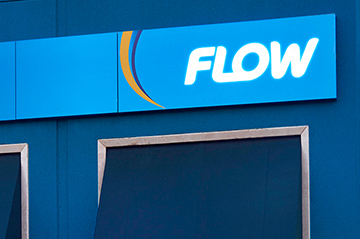 The displays also housed six double shoe shelves to highlight the other colours available within each category, LED lighting to highlight the shoes below and a 42” Commercial grade LG Digital Signage Display. 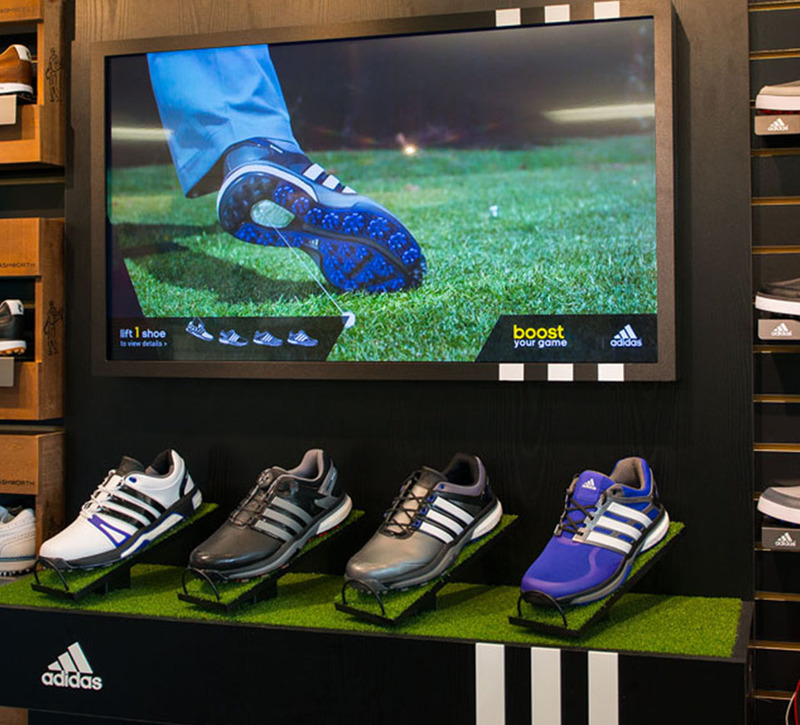 By incorporating interactive digital experiences into adidas Golf innovative product displays, customers are able to educate themselves without the assistance of staff members. Shikatani Lacroix Design worked closely with adidas Golf to ensure that consistency was maintained across the shelf units created. Shikatani Lacroix Design integrated the latest in digital technologies into an immersive brand strategy for adidas Golf to showcase the features and benefits of its golf footwear. 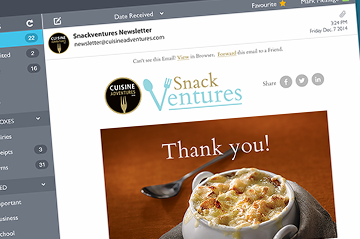 On average, consumer interaction with digital experiences in retail results in 40 per cent higher sale rate conversions. The new shelving displays provide customers an opportunity to compare and contrast the four different footwear categories. 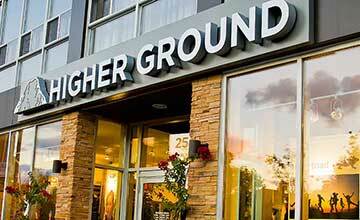 The adidas Lift & Compare campaign has been successfully implemented into eight locations across the country; Vancouver (University Golf Club), Toronto (Islington Golf Club), Calgary (Golf Town), Burlington (Golf Town), Oakville (Glen Abbey TaylorMade Performance Lab), Toronto (adidas Performance retail store), Ottawa (adidas outlet retail store) and Woodbridge (adidas corporate store). 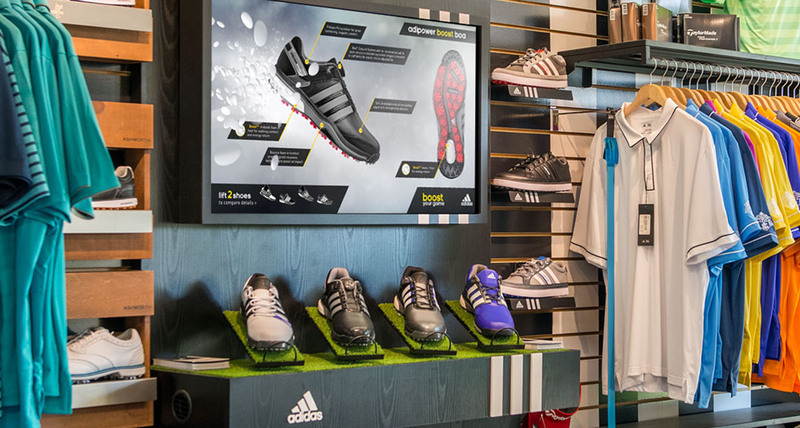 Shikatani Lacroix Design helped adidas golf own the at-purchase moment by integrating the latest in digital technologies into an immersive brand experience to showcase the features and benefits of its golf footwear. 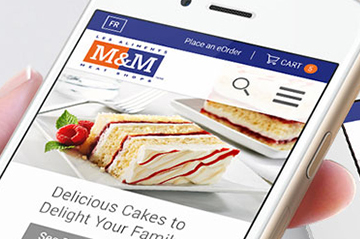 Customers where able to interact with this experience simply by lifting one shoe to gain details on that product or lift two shoes to see a side by side comparison. 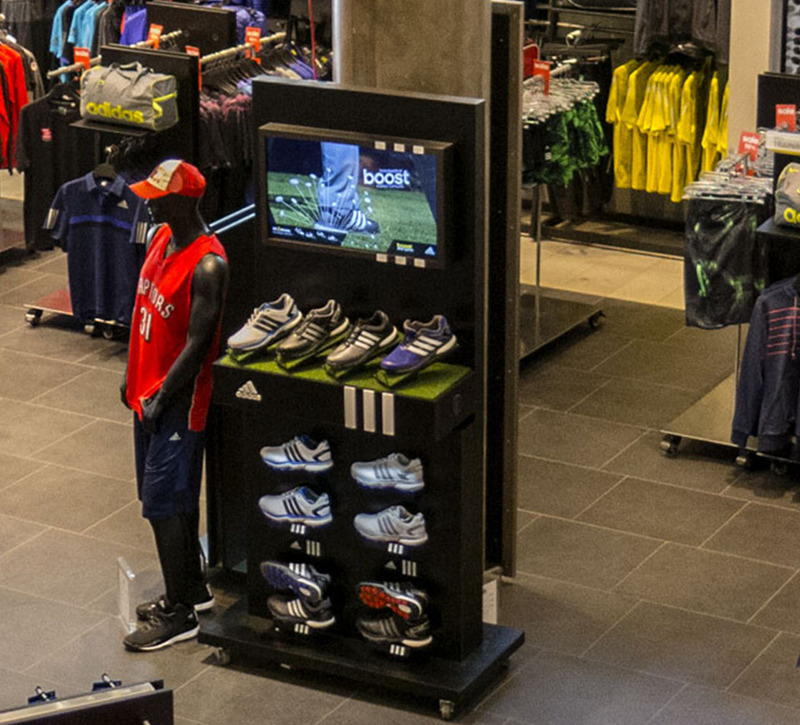 The rich animated content and detailed product information truly helped this product stand out at shelf and immerse customers in an adidas brand experience.